The Fischer-Giotto Image, available in the U.S. since 2012, will be used in an introductory course for breast surgeons learning about stereotactic breast biopsy. The dual-detector system used in the mammography exam and the biopsy procedure will also be on display in Booth #203 at ASBS's 14th annual conference May 1-5, at the Sheraton Chicago Hotel & Towers. The only prone breast imaging system with dual detector for both mammography and biopsy procedures. Fischer Medical Technologies will work with the educational arm of the American Society of Breast Surgeons (ASBS) by providing the use of the Fischer-Giotto Image for the introductory stereotactic breast biopsy workshop at the upcoming 14th annual ASBS conference. Fischer’s skilled technical staff from the U.S. and Italy will be assisting with the instruction. 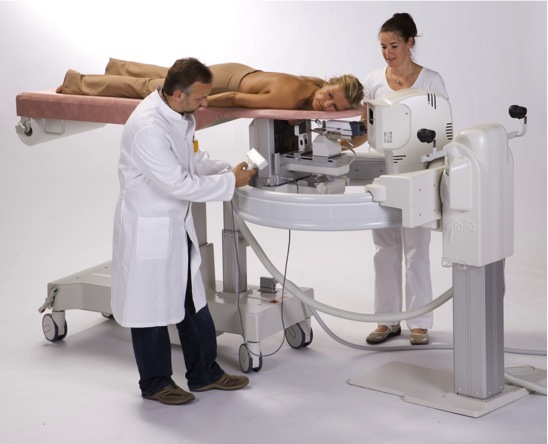 The Fischer-Giotto Image is the only prone breast imaging system that uses the same detector during both the mammography exam and the biopsy procedure. This unique feature minimizes the need for additional exposures and dose, while providing superior quality images. The precise correlation of images produced by the dual-use detector provides more confidence, especially in vacuum assisted biopsies of subtle micro-calcifications. The Fischer-Giotto Image, a FFDM (full-field digital mammography) and stereotactic breast biopsy system, was introduced in the U.S. in 2012. The first installation of the Fischer-Giotto Image was at Boulder Community Hospital, in Boulder, CO, replacing the Fischer Mammotest system. It is receiving enthusiastic reviews from both the physicians and technologists. Additional systems have been installed at Mankato Clinic (MN), Saratoga Hospital (NY) and Derby Family MedCenters (KS). ASBS’s Stereotactic Breast Biopsy: An Introductory Course is a full-day session geared toward the breast surgeon with little or no prior experience in stereotactic breast biopsy. The course is currently filled to capacity, however, the Fischer-Giotto Image can be seen at the Fischer-Giotto Booth #203, at the ASBS conference, May 1-5, at the Sheraton Chicago Hotel & Towers. Fischer’s roots go back to 1910, when H.G. Fischer, the oldest manufacturer of X-ray imaging devices in the United States, began its operations in Chicago, IL. Fischer Medical Technologies LLC is based in Broomfield, Colorado and is the successor company to Fischer Imaging. Fischer Medical was formed in 2006 by the original founders of Fischer Imaging following the acquisition of all the assets of Fischer Imaging, including all patents, trademarks, product designs, and 510(k) filings. Fischer’s focus is on developing differentiated technologies to improve imaging systems’ efficiency and effectiveness through innovative and creative designs. Contact info@fischermti.com.